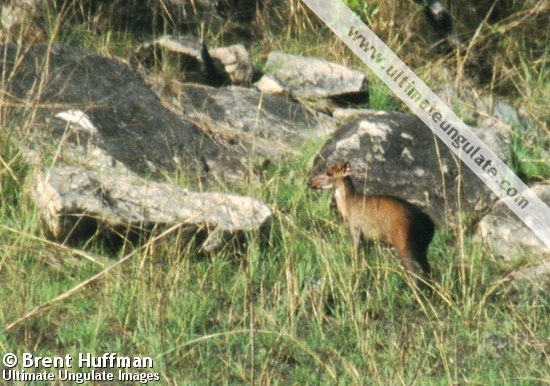 Peters's duiker is a small reddish-brown antelope, although there is considerable variation in color between individuals. The underparts are paler than the body. A black dorsal line begins between shoulders and runs along the spine, expanding to cover the rear flanks. The legs, shoulders, neck, and face of some individuals are also dark. Two pale spots are found below and behind the eyes. Both sexes have spike-like horns that extend backwards from the forehead. In males, the horns average 8-10 cm in length, while 4.0-5.8 cm is typical for females. A rich russet tuft of hair surrounds the horns. In the field, "red duikers" are often difficult to tell apart, especially as they flee. Even photographs can be a challenge, depending on the angle. 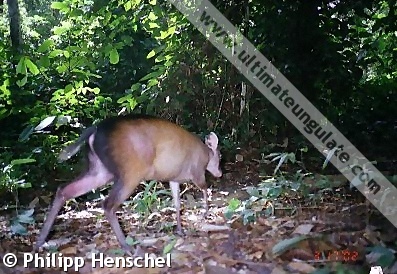 A dorsal stripe that expands over the rump and haunches is characteristic of Peters's duiker. The bay duiker (Cephalophus dorsalis) most closely resembles Peters's duiker, but is nocturnal and has a dorsal stripe which narrows to the width of the tail. 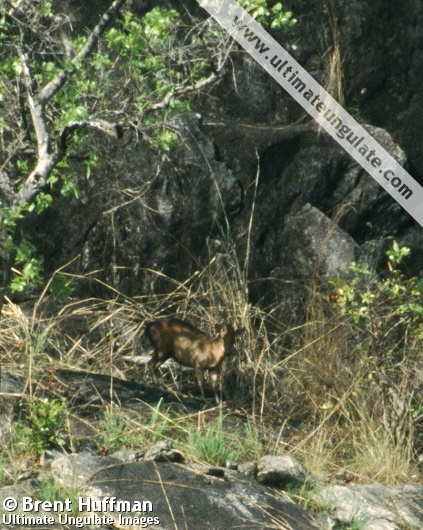 Similarly, Ogilby's duiker (Cephalophus ogilbyi) can be recognized by its narrow dorsal stripe. 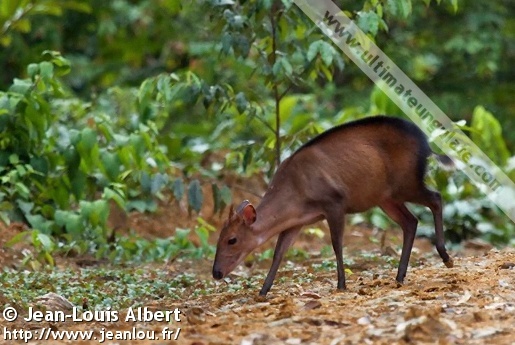 The white-bellied duiker (Cephalophus leucogaster) has a dorsal stripe that widens in the center of the back. The belly is noticeably pale and whitish. The black-fronted duiker (Cephalophus nigrifrons) and Weyns's duiker (Cephalophus weynsi) do not possess a dorsal stripe. Weaning: Unknown. Likely around 4 months. Sexual maturity: Unknown. Probably around 18 months. Reproduction occurs year-round, although more births occur early in the dry seasons (May-June and December) when fruit is most abundant. Infants are dark brown in color and possess the black dorsal stripe of adults. Peters's duiker is active during the day and spends the night resting or sleeping. These diurnal habits allow Peters's duiker to coexist with the nocturnal, but otherwise very similar, bay duiker (Cephalophus dorsalis). This species usually feeds in open areas, but flees into dense cover if threatened. Daytime resting areas are tyically in thickets, but sleeping spots at night are often in areas with minimal undergrowth. An adult female occupies a home range of approximately 40 hectares; this overlaps with those of several other females and a male. Males are thought to keep other males away from their territories. Population densities range from 0.6 to 15.5 animals per km2. Family group: Often solitary, but one male and several females usually live in the same area and have a social system. Diet: Principally fruit; also leaves, flowers, fungi, and animal matter. Main Predators: Large and medium carnivores, especially leopard. Lowland rainforests in west-central Africa. Dense undergrowth is an important habitat characteristic, providing shelter. The approximate range is depicted in the map below. Threats: Habitat loss (due to settlement and agriculture) and hunting. The estimated total population is 382,000. Populations in remote areas are generally stable, but are declining in regions influenced by humans. 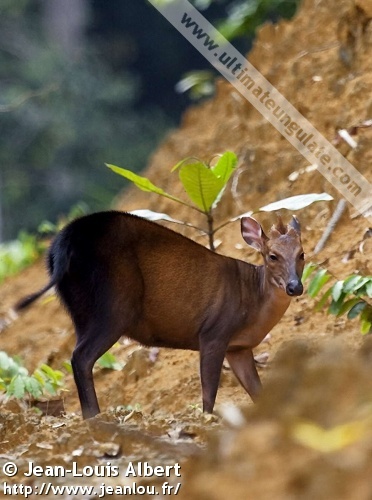 Given proper protection, Peters's duiker has the potential to recover rapidly in areas where it has been depleted.